I can’t believe it’s time for Halloween baking already! These cupcakes could actually work any time of year for a monster themed birthday party, but they’re especially cute for Halloween. Okay so they’re definitely more cute than spooky, but this is me here! I just did these for a party and the kids went crazy over them! This is also a great project for kids. They can make the monsters any color they want, and decorate them with all different kinds of candy. The first thing I did was make the eyes. I made them different sizes using white fondant and placing them on toothpicks. Next I melted some red candy melts, the ones you can get at Michael’s, and dipped half the eye in it. I let them all dry on a sheet of parchment paper while I made a batch of cupcakes and some buttercream. Once the cupcakes were completely cool I frosted them with buttercream that I colored purple and orange. I used a piping bag with a #133 tip to get the look I was going for. Make eyes by rolling white fondant different sizes & placing on toothpicks. Melt candy melts in microwave & dip half the eye in it. Place them on a sheet of parchment to dry. Bake cupcakes & make buttercream. Color buttercream orange & purple. Insert eyes and complete them by painting them with black food coloring. Make mouths out of gumballs & peach rings. Cut out little triangles of white fondant for teeth. >These are too freggin cute! What a great thing to have at a Halloween party! >Oh wow, what a cute idea..you did such an incredible job!!! I love these!! >These are so cute! Thanks for sharing! >Uber cute Meghan! 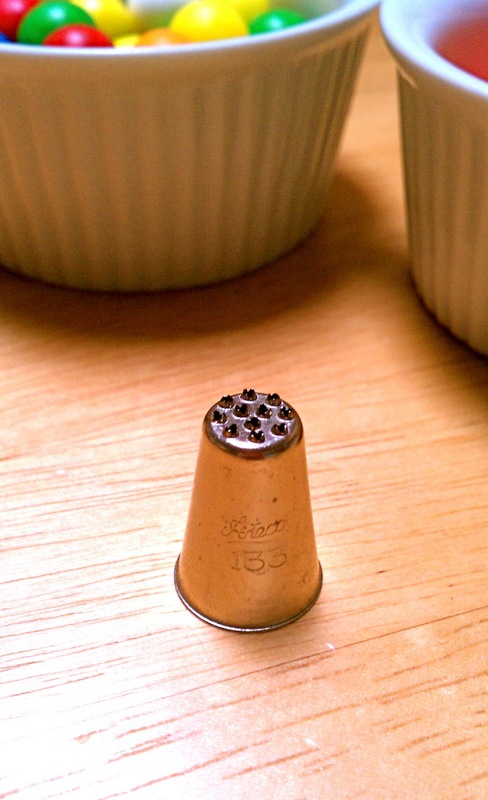 How fun would it be to make these at an adult Halloween party, preferrably before the spiked cider is served! >Those are so cute! I want to pick them up and have them sing the Muppet's Mahna Mahnam! >These are INSANELY cute!!! Your piping is amazing! >Wow! You are so talented! What a fun idea!! >I love these cupcakes!!!! They are totally awesome and my son would die if I made him these lol. I am going to make him some halloween cupcakes but they won't be this cute. >TOO cute, I need one of those tips! >Oh, my gosh! You do the most wonderful things with your decorating talents! These are such cute cupcakes…so fun!!! >These are the CUTEST things I've ever seen! I love halloween anything, and these cupcakes are no exception. Love love love them!! >These little babies brought a smile to my face. So Cute! >My kids would love making these! How cute! >Those are SO adorable! Honestly, you are amazing! I bet everyone whet crazy for them! I love it! >These are too cute! Can't wait to see what other Halloween creations you come up with! >Wow! These monsters are so cute. Great job! >These look so great! I am in love with this idea – kids and adults alike would love these. I tweeted this recipe and buzzed you! >These are awesome! Never mind kids…they put a smile on my face! Truly creative…and great tips! >These are so incredibly cute…almost too cute to eat, but I totally would since I am sure they are delicious! >These are so fun. I pinned them. >How cute! 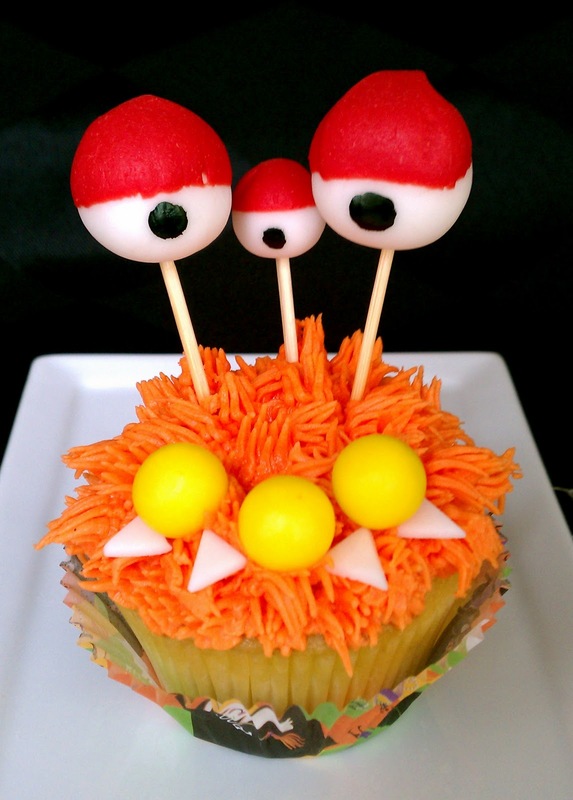 My kids would love to dig into these little monsters!!! >Oh my goodness, girl! These are fantastic! I just showed my two small guys (7 and 3)the pictures of them and they asked when we could start making our own! So cute!! >This is so cute! I mean this as a compliment but they look like Muppets . Totally deserving of the Top 9! >Those are adorable! I absolutely love them…I'll take 3 dozen. haha. Congratulations on the Top 9! >cutesy tootsie! although I think you meant to say "gumBALLS" instead of dumDROPS?? I kept looking at the pics for the gumdrops and there definitely aren't any. >These cupcakes are adorable! Love the gumball eyes! So unique! >i really like your food pictures and want to invite you to try out tastingspot.com. it's for anyone that just wants another place to submit photos and share it will other foodies. It’s still in beta version, but would love for you to start adding some photos and help get it going. >These are SUPER cute! Your frosting looks perfect! And yes, very unique. Loves! >oh my god I LOVE these!! So super cute! The eyes on the toothpicks are amazing. >These came out so cute. I bet kids would love them. Great job on these. >Fun Fun Fun Fun!! Cute idea!! >These are as cute as can be! And you're right, versatile enough for any time of the year, but festive for All Hallow's Eve. Brava! >All I can say is "will you adopt me"? >These are simply amazing. Well done indeed. I love your creativity! >oh wow! These are adorable! !